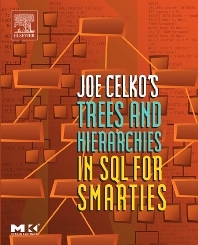 Joe Celko's Trees and Hierarchies in SQL is an intermediate to advanced-level practitioner’s guide to mastering the two most challenging aspects of developing database applications in SQL. In this book, Celko illustrates several major approaches to representing trees and hierarchies and related topics that should be of interest to the working database programmer. These topics include hierarchical encoding schemes, graphs, IMS, binary trees, and more. This book covers SQL-92 and SQL:1999. · Includes graph theory and programming techniques. · Running examples throughout the book help illustrate and tie concepts together. · Loads of code, available for download from www.mkp.com. "I want to say clearly that I think the subject of this proposed book is one for which there will be considerable demand...the topic is poorly understood in general and a good book on the subject will be helpful to the SQL community at large. This book should be of great interest to real-world application programmers...I think that this book would be used on a day-to-day basis (rather than languish on a shelf until some special problem arose)." -Jim Melton, author of SQL:1999.